This review is spoiler-free, but will obviously talk about all of the other Spider-Man movies released up to now. Ten years ago, Sam Raimi made Spider-Man 2, a film that stands up as one of the greatest comic book movies ever made, even after a decade in which Christopher Nolan and Marvel Studios came along and revolutionised the genre. 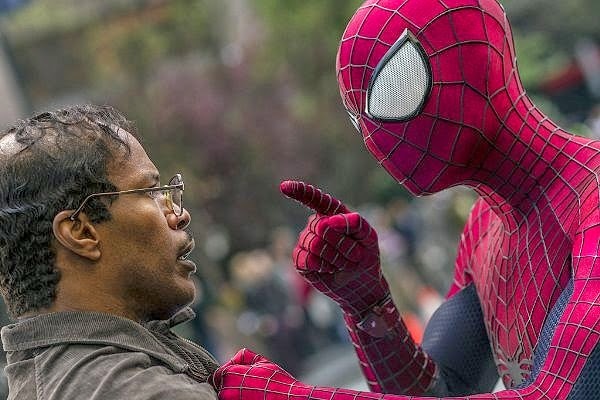 The Amazing Spider-Man 2 has much more to live up to than its predecessor, a premature reboot that was roundly and deservedly lambasted as a washed-out, incoherent bash at Spider-Man Begins. Having dreaded this one all year, it might actually be one of the most pleasant surprises of the year. While it's at least as over-stuffed with sub-plots as the interesting disaster that was Spider-Man 3, it's a much livelier and more colourful affair than the previous film. Peter Parker is still angsting over his doomed romance with Gwen Stacy, and the two of them can't seem to actually stay away from each other. Nevertheless, Spider-Man's notoriety has made him a hit with the people of New York, even as his enemies within Oscorp make plans against the webslinger. My real difficulty with the previous film was that despite the superb cast that Webb assembled to re-imagine the origin story, it all seemed to have been actioned from a studio spreadsheet that was designed to keep the mighty Marvel Studios from getting their mitts on their most iconic character for an Avengers movie. Thank goodness that everyone has learned their lesson in time for the sequel, allowing the reasons why these people were chosen to reboot the franchise to come through. Similarly, the real-life romance between Garfield and Emma Stone transfers beautifully into a riveting chemistry between Peter and Gwen. Their romance was by far the best part of the first film, and it's foregrounded here (albeit for slightly nefarious reasons on the part of screenwriters Roberto Orci, Alex Kurtzmann and Jeff Pinkner) to delightful effect. Theirs may arguably be the only thread to latch onto, in a sequel that is, as far as that pesky spreadsheet is concerned, a platform for future films in Sony's new pocket Spidey-verse. With a Sinister Six spin-off having already been announced, they have to start introducing members of that roster. I counted at least four potential members, and references to two more, which lends to the feeling that the film is stacked slightly too high at times, and it shows most clearly in the harried editing. Paul Giamatti is clearly delighted to be playing the Rhino, and is used for the maximum impact in action-packed bookends, while Dane DeHaan's Harry Osborn is a more relatable antagonist. 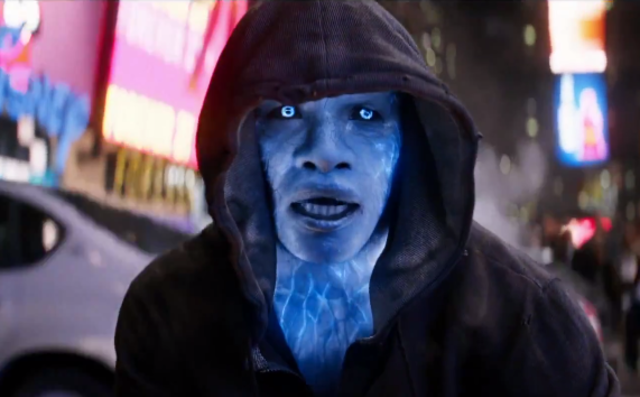 The Big Bad, as far as the marketing is concerned, is Jamie Foxx's Max Dillon, aka Electro. Few reviewers have been able to resist describing the chemistry between Garfield and Stone as "the real electricity" in the film, in a slam against the film's weakest aspect- an underwritten and overplayed character that plays like Duane Dibbley turned Arnie's Mr. Freeze, with the motivation of Jim Carrey's Riddler. He might not be wearing cheesy green spandex and a gnarly lightning mask, but that doesn't mean Foxx has it any less ridiculous, and nobody seems particularly interested in giving him enough screentime to fill him in with anything more than broad strokes. Just as the Lizard was a major sticking point in the previous film, Webb finds the human interactions far more interesting than the CG fights. In consequence, it almost seems like Peter forgets about Electro for the middle part of the film, not even questioning that the mistrustful Oscorp are responsible for his care. Instead, it's about the real possibility of losing Gwen to ENGLAND (dramatic chords!) and losing his old mucker Harry to a terminal illness that only the spider venom in his blood can avert. In a weird way, this would probably be a better film without those admittedly impressive dust-ups with Electro. In many ways, it's a far more refined go at the character-led story that they attempted first time around, and even if Electro betrays an apparent disinterest in comic book heroics, it's interesting to see a superhero film that isn't propelled forward by a villain. The action sequences don't suffer either- Max is most interesting when he's zapping things, and a final confrontation proves to be the most traumatic and brutal setpiece that any comic book movie has dared to float for a 12A audience. If it feels a little blunt, especially with so much clumsy foreboding, then it's still an undeniably effective ending. The Amazing Spider-Man 2 is a terrific turnaround, and a sequel that is unquestionably better than the "original". It doesn't have the self-assured pacing and balance of Raimi's Spider-Man 2, but it makes a far better case for NuSpidey than I ever anticipated. 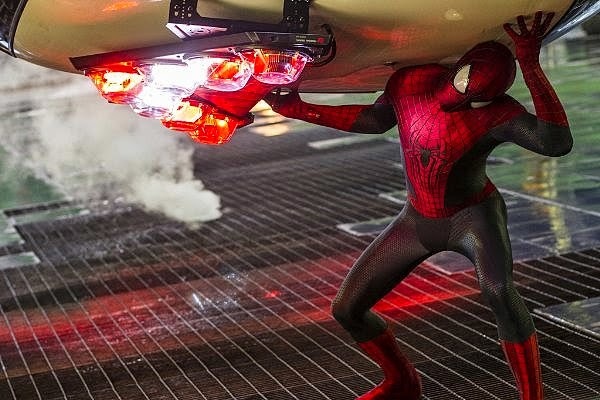 There are pitch-perfect character moments scattered throughout the quagmire of backstory and bad habits from The Amazing Spider-Man, and while the script still leaves a lot to be desired, there's more than enough to point to better things from this incarnation of Spider-Man in the not-so-distant future. The Amazing Spider-Man 2 is now showing, in 2D and 3D, at cinemas and IMAX screens nationwide.